This article will provide assistance in setting up an employee using the Employee Wizard. From your business dashboard, you can click on 'Add Employee' text or the 'Add Employee' button as shown below. This will initiate the simple 4 step Employee Wizard process. When entering an address, auto-complete suggestions may be presented. To pre-fill an address, click on a suggestion. This will also autocomplete the Residential Suburb field. If the suggestions are not adequate, enter the address manually. 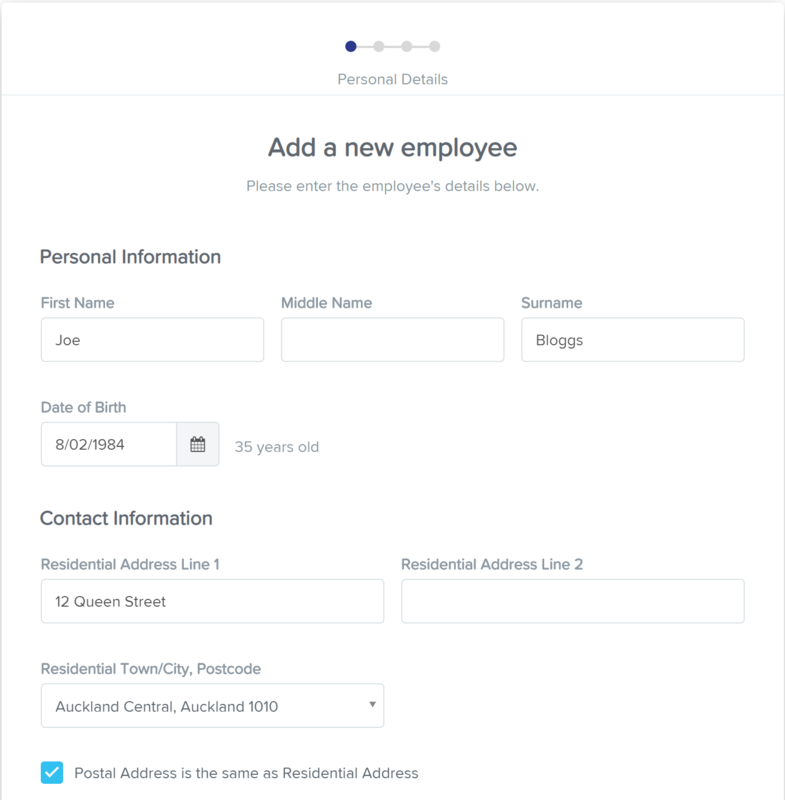 If the employee's postal address is different to their residential address, untick the Postal Address is the same as Residential Address checkbox. Additional fields will appear where you can enter the postal address details. 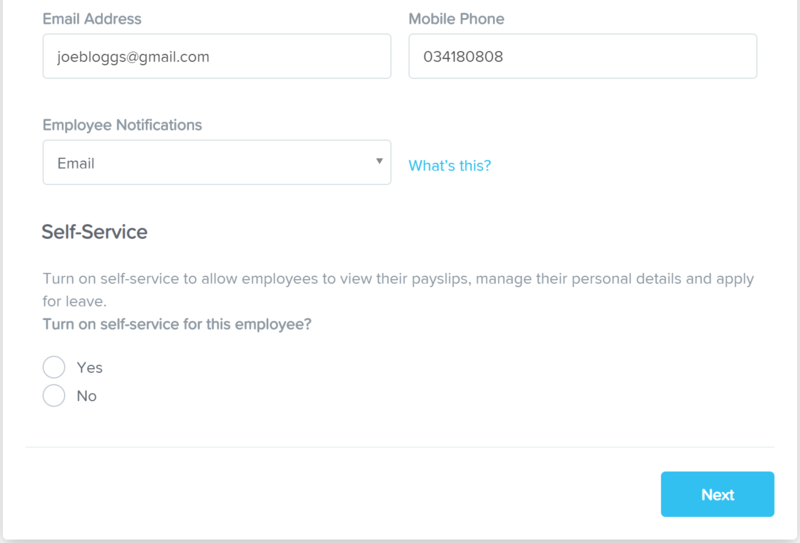 The Self-Service setting controls whether the employee will have access to their employee portal (where they can view their pay slips, apply for leave, action shift requests, etc). If you select "Yes", the employee will be sent an email or SMS (depending on their notification setting) with instructions on how to set up their password and log into their portal. Click on the 'Next' button to continue to the next step. This step requires the Employee's banking and KiwiSaver details. Entering in the employee's bank details are compulsory. Bank details: There are 3 options of Electronic (via a bank file), Manual deposit or Cash/Cheque. Account Name is auto-filled from the employee's name. You can manually delete the auto-filled account name and enter in the account name as well. Account Number is 15 or 16 digits which consist of the bank code, account number and suffix. 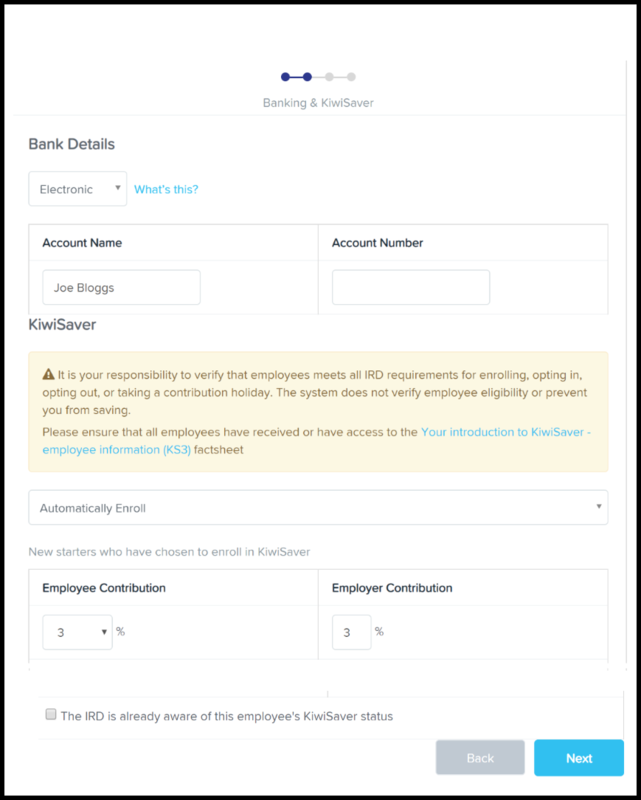 You must automatically enroll new employees into KiwiSaver and provide Employee Information (KS3) factsheet to new employees. 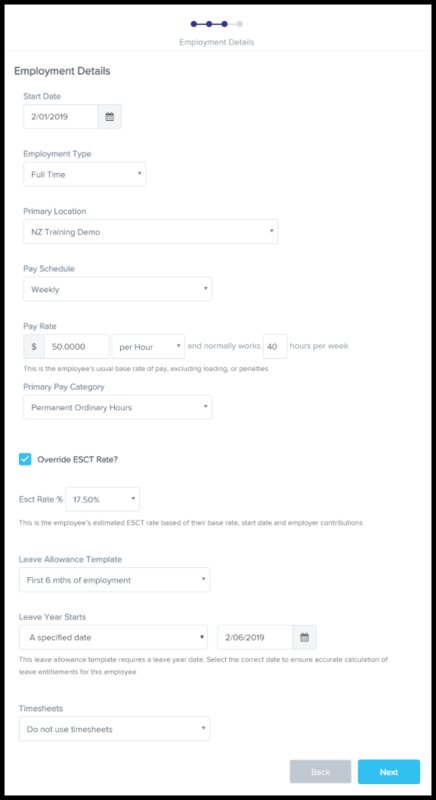 The employee can choose to opt out between week 2 and week 8 from their employment start date by completing a KiwiSaver Opt Out Request form. It is your responsibility to verify that employees meet all requirements for enrolling, opting in, opting out, or taking a contribution holiday. The system does not verify employee eligibility or prevent you from saving. For more information, please click on this link here. KiwiSaver Options: Automatically Enroll, Opt-Out, Contribution Holiday, Ineligible. Employee Contribution: The employee can select from 3%, 4%, 6%, 8% or 10%. Employer Contribution: As an employer, you must contribute at least 3%. You can contribute more if you wish by entering in the relevant value in the Employer Contribution field. If the IRD is already aware of the employee's KiwiSaver status, then tick on this checkbox. However, as a new employee, this should generally always be unticked. Once the Banking and KiwiSaver details are complete, click on the 'Next' button to continue to the next step. This section allows the user to configure the pay details for the employee such as rate of pay, pay schedule and primary location. Start Date: Compulsory field. Select the employee's start date. Employment Type: Compulsory field. Employment type options are Full Time, Part Time, Casual. Primary Location: Compulsory field. The primary location value is the location that will be assigned as the employee's default location. If the employee will be working in more than one location you can select multiple locations once you have completed the employee wizard. You can attach more than one location to an employee via the "Locations" screen within their employee details file. You can also create a new location from the Primary Location field by clicking on '+ Add New' in the dropdown. Pay Schedule: Compulsory field. Pay Schedule options can be Weekly, Fortnightly, Monthly, Twice Monthly. You can set up your pay schedules via your business pay schedule settings which will then appear in the Employee Wizard to select from. Pay Rate: Compulsory fields. If you are paying an employee an annual salary, ensure you enter the annual salary in the Pay Rate field and then change "per Hour" to "per Annum". Similarly for per day pay rate and changing "per Hour" to "per Day". Primary Pay Category: Compulsory field. Pay Categories are used to define the rates that employees are paid. Primary default pay category options are generally: Permanent Ordinary Hours, Casual Ordinary Hours, as well as a list of Leave pay categories. You can set up different pay categories based on your company's structure and requirements. ESCT Rate %: This will automatically apply the ESCT percentage rate once the Pay Rate details have been entered. However you can override this rate by ticking the "Override ESCT Rate?" checkbox. Leave Allowance Template: Optional field. Leave allowance template default options are 'First 6 months of employment' and 'Thereafter'. Further reading on leave allowance templates can be found here. This field is not compulsory, however if you do not assign anything here, employee leave accruals may be incorrect. Leave Year Starts: This field will appear where you have selected a Leave Allowance Template that includes the 'Based on employee's leave year setting' and also if you are using the system default leave allowance templates. Leave year start options are 'Employee's start date' or 'A specified date'. Where 'A specified date' is selected, a date picker will appear for you to enter in the correct specified date to ensure accurate calculation of leave entitlements for the employee. If you are using the system default leave allowance templates, you should select 'A specified date' and then enter the date 6 months after the employee's start date. The reason for this is so that Sick Leave and Domestic Violence Leave entitlements hit the employee's leave balance at the correct time. Timesheets: Optional field. Timesheet options are 'Do not use timesheets' and 'Use timesheets'. If the employee is not required to submit timesheets in order to get paid and/or are paid their set number of hours by default, select 'Don not use timesheets'. This will then activate the setting for the employee to be paid the number of hours set in their file by default in the pay run. Once all Employment details have been entered in, click on the 'Next' button to continue to the next step. This section is for entering the tax code declaration information for the employee. IRD Number: This is a compulsory field. Enter in the employee's 9 digit IRD Number. Date Signed: Optional field. Enter the date the employee signed the Tax Code Declaration form in the Date Signed field. 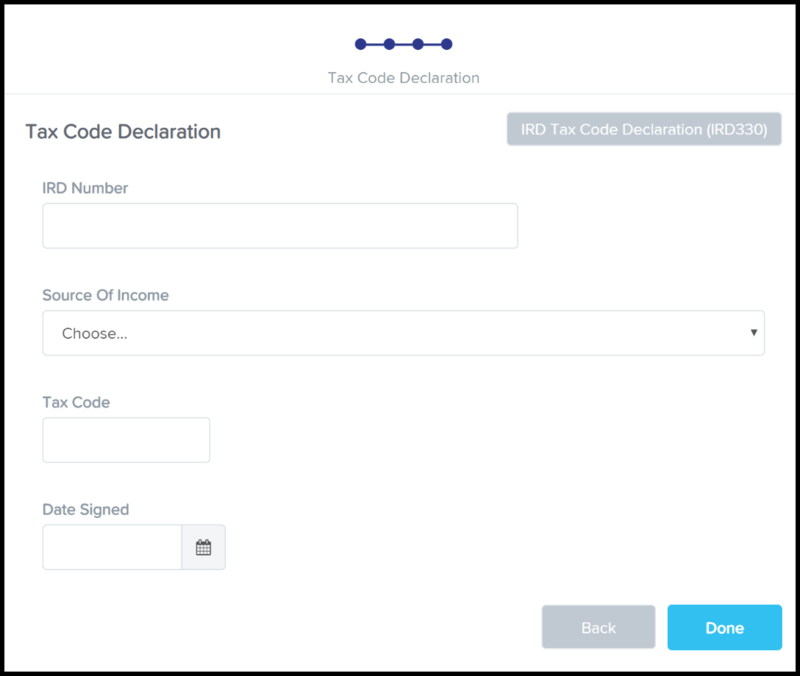 Once all tax code details have been completed, click on the 'Done' button.